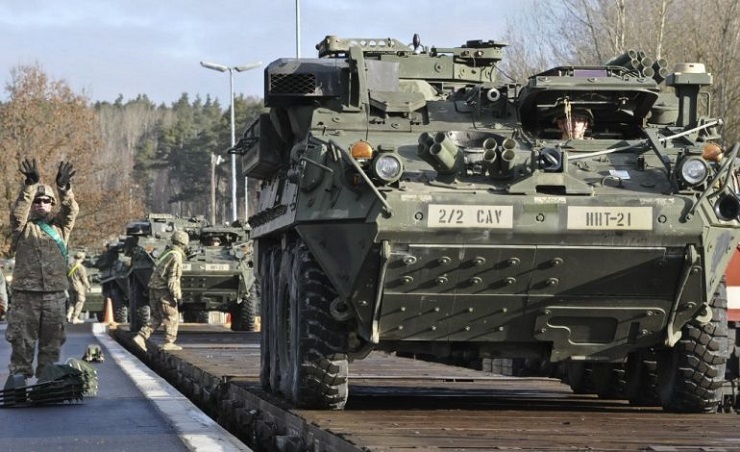 In response to the USA’s request to increase defense expenditures, the European member states of NATO, at the insistence of France and Germany, have suggested establishing the Permanent Structured Cooperation (PESCO) within the EU, which “may be perceived as the predecessor of the European army.” So, though supporting ‘independence from the USA’ in questions of military policy, EU countries nevertheless keep issues of military cooperation in Europe as priorities for themselves. For decades, Europe was able to increase integration in the economic and political spheres, but not in the military field. Matters of European defense were entirely delegated to NATO, behind which there stood the USA. “This is not about the creation of the European army or about the replacement of the NATO’s collective security. However it is the first step to an independent European defense with projects of shared property, joint military allocations and over time, perhaps, with the deployment of joint troops. At a time of deficit budgets the nowadays split expenses may also win in efficiency,” the French press noted. Britain, following the USA’s instructions (the later being vehemently opposed to the idea), hurried to call this potential and purely European establishment a “phantom army”, having specifically stressed: “The defense of Europe will not be strengthened by weakening the bond with the United States or competing with NATO.” To support the position, ‘strategists’ from London give prominence to the ideas obviously inspired by Washington, such as that the enthusiasm backing PESCO stems only partially from the fear of Russia, but to a greater extent from the desire to shake off pressure by D.Trump in the future. Thus, eventually it may drive wedges between Eastern and Western Europe, between the US and the EU. Great Britain should stand back from it. In the forthcoming years, emphasis on force and the authority of NATO has to become its priority. For many years Britain has blocked such types of cooperation, being concerned by the fact that the creation of a European army would undermine the positions of NATO and London’s alliance with Washington. However, as the US acknowledges, taking into account that Britain has voted for separation from the EU, other countries of the block, in particular France, Germany, Italy and Spain, have considered the postponed idea of military cooperation as a way to show to the citizens that Brussels is capable of reacting to their concerns about security and terrorism. Though Europe does not have a unified strategy because of the unveiled pressure of the USA, nevertheless, on November 13 the 23 EU member states out of 28 ones declared their readiness to strengthen military cooperation within PESCO. As the German press reported: “Someone has even started talking about the formation of a new military alliance.” However, no doubt, this initiative first of all shows new pragmatism in the European integration policy and the desire to terminate the dictatorship of Washington; especially as nowadays the EU countries are forced to save funds, and, as research shows, cooperation within PESCO would facilitate saving billions. PESCO is an ambitious and inclusive European legal framework for investments in the security and defense of the EU territory and its citizens, as it is specified in the document signed on November 13 by the Ministers. Formally PESCO will become a reality after approval by the qualified majority in the EU Council on foreign affairs; the vote is scheduled for December 11. As many European analysts note, at least in the beginning, PESCO will not be a defense alliance, but a tool which will unite military investments and create the best basis for carrying out joint operations. Each member state has to undertake 20 obligations. The obligation for the acceleration of the commitment of forces, including “possibly reviewing their national decision-making procedures” is particularly relevant. German experts consider PESCO to be a clever way out of the dilemma of practical needs and strategic disagreements. “Not all the EU countries are obliged to take part in it. And not all participants of PESCO have to participate in all the projects. It allows the states to discuss political priorities in small groups from one project to another.” Although the signed document seems to be far from politics, it resembles the traditional line of a strictly European defense policy. The Germans are confident that establishing the new alliance will allow to try out the “still unused opportunity of the Treaty on the European Union: after decades of self-restriction the EU will for the first time have a real tool for military cooperation“. There is no doubt, however, that this step towards European military integration will not go smoothly. As former Executive Secretary-General of the European External Action Service and former Ambassador François-Pierre Vimont stated: “For the countries of Central and Eastern Europe the threat is in the East. For the countries of Southern Europe it is on the other side of the Mediterranean Sea. It may become a genuine problem.” Even now, certain disagreements on establishing PESCO have already became visible, as not all 28 EU countries have supported the prospects of European defense. One of the main initiators of PESCO establishment, Emmanuel Macron, specifying his plans as President in Sorbonne, claimed that in ten years, Europe will have a common “European intervention force”, a “common defense budget” and a “common doctrine”. However, it is too early to say whether this cooperation in the defense sphere leads PESCO to the creation of the European army, as E. Macron wants. There is still a long journey ahead. As it often happens, the EU pushes the irritating matters for later; so, no doubt, it is still too early to talk about the prospects of PESCO.